Helping hand: The Schoolies Recharge Zone has helped thousands of young people at Schoolies Week at the Gold Coast with volunteers handing out water to young people. CAMERAS might show boozing and crude behaviour at the Gold Coast’s most infamous party, but volunteer Vacen Taylor knows a different side to Australia’s school leavers. Ms Taylor, who co-ordinates the Schoolies Recharge Zone, manned by Catholic charity Rosies, said the estimated 25,000 young people partying on the Gold Coast were polite, gracious and full of life. She said her hopeful impression of school leavers came from their grateful attitude towards other Rosies volunteers, who spent last week hydrating and comforting thousands of youth from the partying crowds. 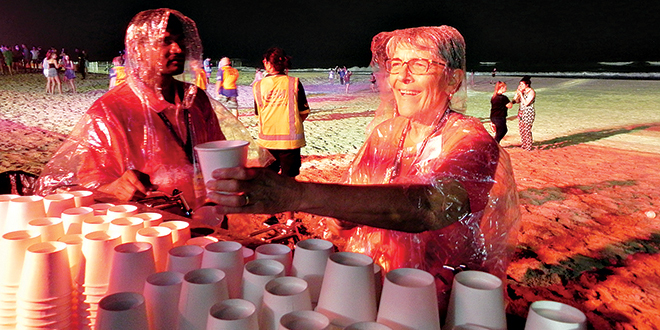 Ms Taylor, a regular Rosies volunteer, has spent the past five years handing out cups of water to school leavers shaking off the stress of 12 school years on the Gold Coast. In those five years, Ms Taylor said she had only seen a small portion of young people joined in illicit behaviour. “Every time I’ve volunteered at schoolies, I’ve always been blessed with the idea that our future is in safe hands,” Ms Taylor said. Rosies’ presence on the Gold Coast kept young people off the streets and in a safe place, she said. “They tell us we’re their saviours,” she said. She said one young woman she looked after on Sunday night was inspired by their care and wanted to volunteer with Rosies in the future. “(Schoolies) is about finishing 12 years of education and celebrating going into the next phase, and that’s a wonderful thing to be a part of,” she said. Rosies volunteers like Ms Taylor have been part of the Schoolies since 1987, when the Queensland branch’s founder Oblate priest Fr Paul Costello took one of the charity’s vans down to the Gold Coast offering friendship and support. While the priests and volunteers initially handed out water to school leavers, Rosies schoolies support grew until the charity was asked to man the Recharge and Recovery Zone. It also marked the beginning of their work with Queensland’s homeless. The Oblates have continued to be present at Schoolies, also making it possible for young faithful Catholics to make their Sunday Mass obligation. Rosies chaplain Oblate Father John David celebrated his first Schoolies Mass at Surfers Paradise this year, and said it was a “beautiful” gathering of young people taking out one hour of the weeklong party to be with God. “I was surprised that so many young people came,” he said. But Fr David said inside the Rosies tent at Surfers Paradise there was no room to have conversations about the faith with young people. “There is no faith element here but we listen to (the young people), supporting them when they approach us,” Fr David said. Three days into Schoolies Week, a Queensland Police Service statement said arrests and incidents were at an all-time low, at a reported 60 per cent decrease. “Police were pleased with the behaviour of the vast majority of schoolies throughout the festivities on Sunday evening,” the statement said.